West Palm Beach Mayor Jeri Muoio, representatives from the City’s Department of Housing and Community Development (HCD) and Community Redevelopment Agency (CRA) joined representatives from the West Palm Beach Housing Authority and Pulte Homes for a ceremonial groundbreaking for Merry Place Estates, 12 single-family homes and 36 townhomes in the Pleasant City neighborhood. Established by the City, the West Palm Beach Housing Authority provides safe, decent and affordable public housing to persons and families with limited financial resources and provides residents with access to programs, which will assist them in making the transition to greater financial security. The City’s CRA provided over $8M in infrastructure improvements such as water and sewer lines and sidewalks needed for the project. The City’s HCD Department, through State Housing Initiatives Partnership Program (SHIP) funds, contributed $304,983 in construction costs to support the leveraging of more than $2,000,000 in private financing from Valley National Bank. Affordable housing incentives consisting of waiver of water and wastewater capacity fees, expedited permitting, and other development fees were awarded totaling more than $200,000. The City may also provide down payment assistance through its existing Home Purchase Assistance program in an amount of $150,000. Prospective buyers must fall within 50 to 120 percent of the area median income, which is generally $74,300 for a family of four. For more information about Merry Place Estates, please contact the West Palm Beach Housing Authority at (561) 655-8530. Housing Stabilization Program, which is designed to provide homeless prevention assistance of up to $3,000 to obtain safe, decent, and affordable rental housing within the City of West Palm Beach. Residential Rehabilitation Program, which provides assistance to low income homeowners for housing repairs of items that compromise the life, health and/or safety of households located within the City limits. For more information about City of West Palm Beach housing programs, please contact the City of West Palm Beach HCD Department at (561) 822-1250. Thursday, October 25, 2018 from 6:00 to 9:00 p.m.
WHO: Guests of all ages in costume, including adults, kids, families, and pets, are invited to attend Clematis by Fright. WHAT: This year’s FREE, family-friendly event offers a spooky twist on the weekly Clematis by Night series. Guests who arrive in costume will have a chance at winning thousands-of-dollars in prizes. Prizes include tickets to top area attractions, hotel stays, concerts, local restaurants, and much more. FREE Halloween-themed attractions for kids include: fun and safe trick-or-treating, games, hay rides, face painting, a caricaturist, balloon twisters, and more. Additionally, attendees will be able to jam out spooky tunes by a DJ. Get a jump on Halloween with safe trick-or-treating kids and families. Activities will be located on the Great Lawn, where kids can safely trick-or-treat with a free Halloween bag provided by Clematis by Night. The bag will be available for pick up near the Haunted Hallows area, while supplies last. Candy will be provided by approximately twenty nonprofit organizations and local businesses. Additional activities include a caricaturist, balloon twisters, and more. WHERE: Clematis by Fright takes place on the Great Lawn in downtown West Palm Beach, just west of Flagler Drive on North Clematis Street. CONTACT: For more information about Clematis by Fright or the City of West Palm Beach’s other free community events, please visit www.wpb.org/events or call (561) 822-1515. For news and updates, follow the City of West Palm Beach on Facebook @CityofWPB and on Twitter @westpalmbch. TRANSPORTATION: For visitors not arriving by broom, convenient parking is available in two City of West Palm Beach garages, Banyan (on the corner of Banyan Blvd. and Olive Ave.) and Evernia (on the corner of Evernia St. and Olive Ave.) The City’s garages are just a few blocks away from the action. Additionally, the City’s fun and free trolley has several stops near Clematis by Fright. Residents, business owners, and community members are invited to attend an Open House event about the Historic Northwest District presented by the West Palm Beach CRA. Guests can hear about current and upcoming projects planned for the area, get up-to-date information, and ask questions about the future of the Historic Northwest District. Attendees will learn more about the Sunset Lounge renovation and the adjacent Heart & Soul Park, the upcoming Tamarind Avenue and 7th Street improvements, and the Styx Alley commercial alleyway project. There will also be special presentations from Arborist Andrew Tellier and Landscape Architect Ken Gardner.Representatives from various City departments will be on-hand to provide resources and additional information for attendees. For more information, call 822-1550. At the City Commission Meeting on October 22, 2018, Mayor Muoio paid tribute to Mrs. Ineria Elizabeth Hadley Hudnell, a respected educator, artist, historian, musician, who made numerous contributions to the African American Community. For more than 60 years, Mrs. Hudnell collected the history of West Palm Beach. 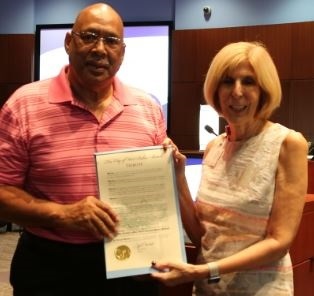 Her important collection and work as an art teacher enhanced her ability to collect a wide variety of documents, articles, photographs and other artifacts that record the history of the African American community in Palm Beach County. She preserved the past in great detail. Mrs. Hudnell was recognized many times with awards and honors for her service and achievements, for her countless contributions and dedication to the community; for her artistic endeavors, her perseverance and sheer dedication. Because of her efforts, many people, young and old, and all ethnic groups have been exposed to black history and have gained an education in this very important topic. The tribute in honor of Mrs. Hudnell was accepted by her son Mr. Earl Hudnell. Holiday Schedule for Homework Centers. To see all of November's Library events, please visit: http://www.wpb.org/News-Video/Archive-News/MANDEL-PUBLIC-LIBRARY-EVENTS-FOR-NOVEMBER-2018. Florida’s General Election is on Tuesday, November 6. Floridians will vote on candidates for federal, state and local offices and ballot initiatives, including 12 proposals for amendments to the Florida Constitution. For election info in PBC, please visit: https://www.pbcelections.org/. Rosemary Ave. between Okeechobee and Hibiscus St. (Monday, October 29, 2018 through Friday, April 12, 2019): Full closure for CityPlace streetscape improvements. Access to all parking garages will be maintained. Pedestrian traffic will be unaffected. Hibiscus St. between Rosemary Ave. and Quadrille Blvd. (Monday, October 29, 2018 through Saturday, February 23, 2019): Full closure for CityPlace streetscape improvements. Access to all parking garages from Quadrille Blvd. will be maintained. Pedestrian traffic will be unaffected. Spruce Ave. between 31st and 30th St. (through Tuesday, October 30, 2018): One side of Spruce Ave. will be closed alternately for curb, sidewalk and driveway replacement. Flaggers will assist motorists within the work zone. Making Strides Against Breast Cancer (Saturday, October 27, 2018, 8:00 a.m. – 11:30 a.m.): Flagler Dr. closed between Banyan Blvd. and Actaeon Pl. All roads open by 10:00 a.m. Sunday, October 28, 2018. Clematis Streetscape 300 block Grand Reopening (Thursday, November 1, 2018, 5:00 p.m.-9:00 p.m.) Road closures on N. & S. Clematis St. between Narcissus Ave. and Flagler Dr., and Narcissus Ave. between N. Clematis St. and Banyan Blvd. Clematis by Fright at Centennial Square (Thursday, November 1, 2018, 6:00 p.m. - 10:00 p.m.): Road closures on N. & S. Clematis St. between Narcissus Ave. and Flagler Dr., and Narcissus Ave. between N. Clematis St. and Banyan Blvd. GreenMarket (Saturday, November 3, 2018, 6:00 a.m.- 3:00 p.m.): Road closures on N. & S. Clematis St. between Narcissus Ave. and Flagler Dr., Narcissus Ave. between Banyan Blvd. and Clematis St., Lantana Ave. between Banyan Blvd. and N. Clematis St.
West Palm Beach Antique Flea & Craft Market (Saturday, November 3, 2018, 8:30 a.m.-2:30 p.m.). Road closure in the 300 block of Clematis. Belvedere Rd., just east of Mercer Ave. at the railroad tracks. (Monday, October 29, 2018 through Friday, November 30, 2018): Two westbound lanes will be closed, 9 p.m. until 5 a.m., Monday night through Friday morning for pole replacement operations. Please note, there will be no work from Nov. 21 – Nov. 25. 45th St. and Australian Ave., at the SFRTA Railroad tracks, and Australian Ave. and Mangonia Dr. (through Friday, November 9, 2018) may have intermittent outside lane closures in each direction, 9 a.m. until 3:30 p.m., Monday through Friday, for FPL pole replacement. Okeechobee Blvd. from Chillingworth Dr. to Spencer Dr. (through Friday, November 2, 2018) will have the outside westbound lane closed, 9 a.m. until 3:30 p.m., Monday through Friday, for underground wire installation.